This will result in a list with each candidate (fertile animal of the current population) and their contributions and mean kinship. Here at the right you find an example of such a list. HouseName is the name of the animal, NOffs is the number of offspring of each animal. Note that the number of offspring differs from the CC (current contribution). There are two reasons: 1) a parent only contributes half; 2) offspring has offspring themselves resulting in an increase of the contribution of the (grand-)parent. MK (mean kinship is a percentage between 0 and 1; while OC is presented in the contribution required from this animal. In this example the current contribution already exceeds the wanted contribution. The only software that calculates kinship and is freely available is PMx. Click here for the website about PMx. The program is well documented in a manual, which you can download from the same website. 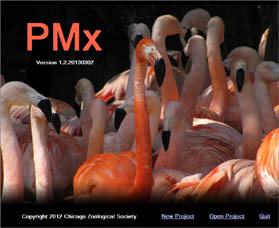 PMx was developed to support Zoos in maintaining their populations. PMx does not calculate optimal contributions. There is a need for software that easy to work with and provides the list as described on this page. A tool that would facilitate breeding for diversity. With a relative small investment this could benefit thousands of endangered populations. Please get in contact if you want to contribute to such a tool, in one way or another!